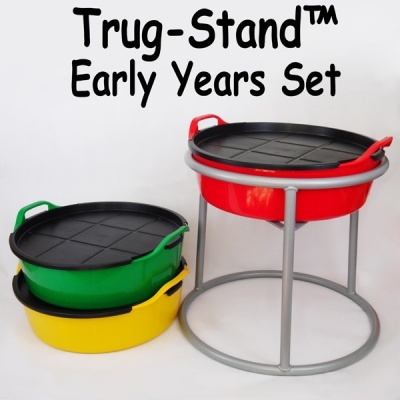 Our unique Trug-Stand™ is designed for pre-school and early years classrooms and is a cost effective solution for messy play, building bricks or water. The 25 litre Rainbow Trug® sits snuggly in the frame and can easily be removed and changed with minimal effort. This is an excellent activity for young children to explore their creativity and develop new skills. Easily change the trug, keep one with sand, one with plastic bricks etc. Heavy Duty metal construction designed for the schools but is also perfect for home use. NOTE: If you would like a different mix of colours, that’s fine we have plenty to choose from. Simple call or email us.